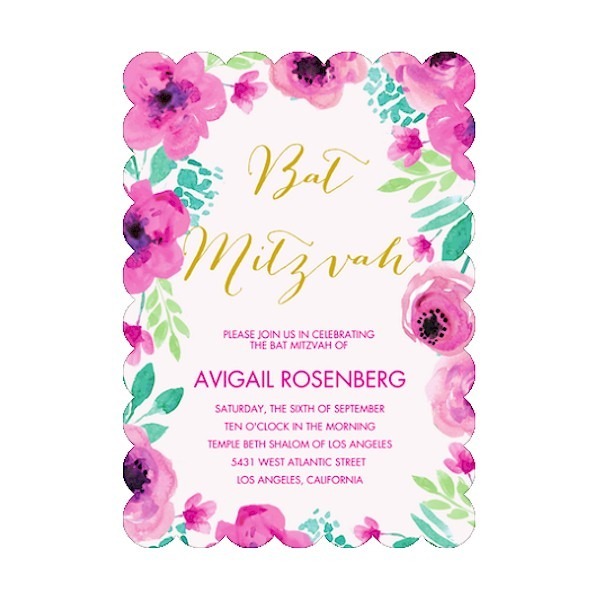 View cart “Wild Rose Bat Mitzvah Invitation” has been added to your cart. Your wording details will be surrounded by colorful floral blossoms on this beautiful Bat Mitzvah invitation. “Bat Mitzvah” appears above your wording in a fancy faux foil script. We’ve trimmed the edges into a scalloped border for a truly impressive presentation. Your wording details will be surrounded by colorful floral blossoms on this beautiful Bat Mitzvah invitation. “Bat Mitzvah” appears above your wording in a fancy faux foil script. We’ve trimmed the edges into a scalloped border for a truly impressive presentation. Other trim options are available. This 100# white card measures 5″ wide by 7″ high. Shown with Gold/Fuchsia inks and lettering style Bombshell/Futura. Single bright white envelopes accompany this Bat Mitzvah invitation.